I like Sharpies. They’re good makers and some of the most permanent I’ve ever used. They’re useful in tons of situations, from signing to just getting something bold out there. The only problem is sometimes they just aren’t small enough. If somethings need to be both permanent and small you seem to be out of luck. Until you find Sharpie pens, that is. The body of the pen is similar to most other pens, it is slim and long. It has a label containing all necessary information about the pen and helping decrease the slickness of the body. The cap has the interesting aesthetic of not being larger than the body, making the pen look slightly odd, but this makes no performance difference. Attached to the cap is a flexible clip that does its job nicely and is not prone to breaking. 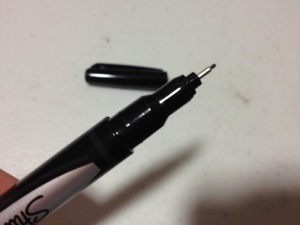 At the bottom of the pen is also a place to slip the cap on so that it does not get lost while one is using the pen. The line produced by the pen is thin, but still thicker than common cheap ballpoints. It comes out exactly where you put it and in that deep black color one expects from a Sharpie. Pressure makes very little variation, the ink is always black, and only slightly lighter if one tries to achieve that effect. 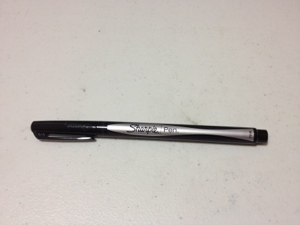 It flows smoothly over most surfaces and sticks everywhere you expect Sharpie to stick. Although it does in the end feel more like a pen than a Sharpie. I stated in the beginning the main reason one would get this pen. It’s a nice small, permanent, bold pen. It’s serviceable at most pen and Sharpie duties. It would even replace fine-point Sharpies for me. But of course it has the problem of not having a specific use. So it would really be up to you whether or not you have a use for this pen.